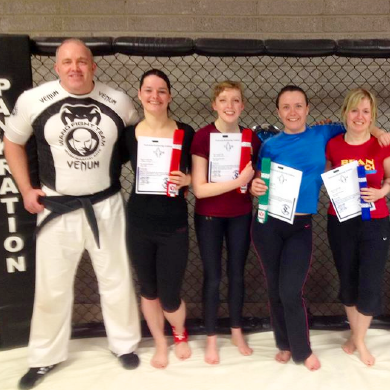 Pankration MMA Kickboxing Academy has been providing top quality professional tuition in martial arts and fitness in Limerick since 1992. Run by Dermot Mc Grath and Catherine Costigan, PKA has classes to suit everyone from Little Ninjas (4-7 years), Kids MMA/Kickboxing, Adults MMA and Ladies Fitness Kickboxing. The students and fighters from the academy have competed in everything from amateur MMA league matches, kickboxing, karate, sanda and pro MMA across Europe and the USA in CageWarriors, Bamma and Invicta. Spread across 4,500 sq ft with 100 sq/m of mats, Twins punchbags from Thailand, tons of S&C equipment and a 24 ft Cage, Pankration is a respected name in the World of MMA training. Head coach of Pankration, Dermot McGrath (right) has excelled over the years in his ability to communication his passion for teaching kids and adults. He achieved this by studying and training in martial arts from a young age. He achieved his Black Belt under the multiple World Champion Alife Lewis. He later competed in many tournaments and continues to do so as this he believes leads to a higher level of coaching within the club. 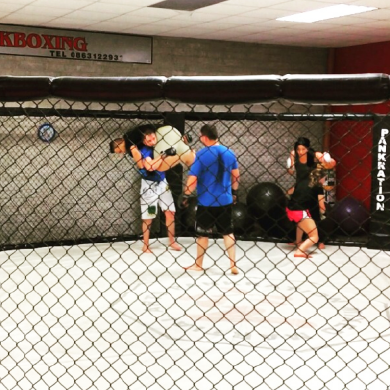 Beginners MMA Monday and Wednesday at 7pm. Message for a free VIP pass.